Item # 310504 Stash Points: 2,499 (?) This is the number of points you get in The Zumiez Stash for purchasing this item. Stash points are redeemable for exclusive rewards only available to Zumiez Stash members. To redeem your points check out the rewards catalog on thestash.zumiez.com. Whether you're trekking through the backwoods or simply hiking up and down the avenues, Forty Ninth Supply Co. has got you covered with their Huntsman Off-White Beanie. This ribbed knit construction offers a warm fit and feel that comes complete with a signature logo patch on the fold over cuff. 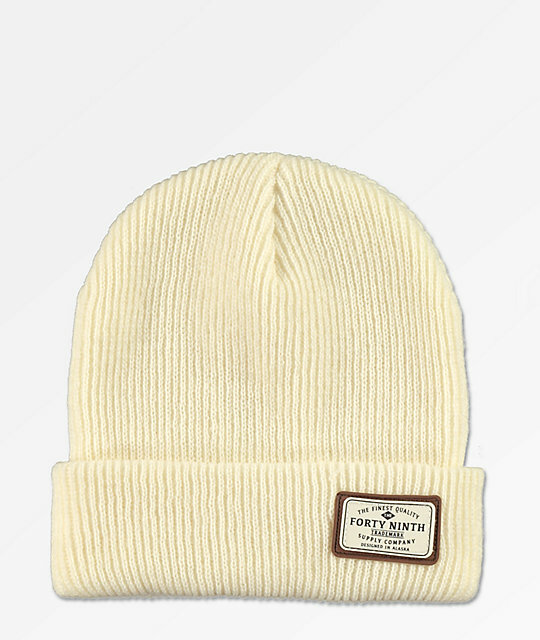 Huntsman Off-White Beanie from Forty Ninth Supply Co.